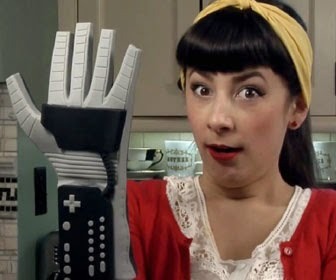 Pete Hottelet, the designer of real Fight Club soap and Stay Puft Marshmallows from Ghostbusters has a new Indiegogo campaign to raise funds for a silicon "Power Mitt Oven Glove." The Nintendo Power Glove is one of the most recognizable video game peripherals of all time. Its iconic status, however, is inversely proportional to its utility. As cool as it looked, it worked nowhere near as well as it seemed it should have. The oven mitt, being made entirely of heat resistant silicone, should do wonders to close the gap between Power Gloves' stylistic strong points and its relative lack of usefulness. On the product's Indiegogo page, Hottelet says "The molds and tooling are already made and ready to go, so this is a $39 preorder." If 450 people pre-purchase the mitt, Hottelet will "place the order." The glove is made of silicone rubber and is "one size fits most," and is designed for the right hand. However, if the orders reach 1,000 then Hottelet will make a version for larger hands, and if 1,500 orders are taken, he plans to make one for southpaws as well. "That's really all there is to it," he says. "I don't plan to make a million of these things, so if you want one, this is your chance to get one." Will you be the baddest kid on your block and order one of these? Let us know in the comments.